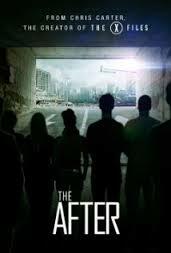 The After is a new Post Apocalyptic TV pilot on Amazon Prime. The story itself isn’t too terrible. They leave you with a ton of questions, something to be expected from the creator of X-Files, but they don’t leave you with enough concrete to keep you going forward. The premise is a group of people get trapped in a parking garage. Something terrible is happening outside, but we don’t know what. A unlikely group of strangers is brought together to survive whatever is going on. When a few of the people actually make it out of the garage there is pandemonium. We know nothing other than everything has hell. The streets are plugged full of people and all we are given is that power and phones are down. Eventually this unlikely group makes their escape to the rich one’s house. Here they are attacked and while they flee end up faced off against some sort of demon or angle or something biblical that appears like it is going to lay a whole lot of judgement on the world. The end. The issue is there is no lack of post-apocalyptic shows anymore. Revolution, Falling Skies, the current front runner: The Walking Dead, or if you want to go back in time a bit, there is Battlestar Galactica, and Jericho. Point being, there are a ton of contenders for your PA time, and I just don’t see this one getting in the ring. The thing that makes any PA show great is the characters. Yeah, we like watching them bash in a zombie’s head with a baseball bat, but at the end of the day if we don’t like that character enough to not want them to die, we are going to find another snow. Maybe they tried to introduce the entire cast too soon. Maybe we will learn more about the characters in the next episode that will make them interesting, engaging, or likable, but for now I am going to turn it off. I will be impressed if it becomes selected for Amazon’s shows, but if it does I would be hard pressed to take the time to go back to it. With so many other great options on the table, I wouldn’t waste your time seeing what this one is about. I am a big fan of Amazon. And I often peruse their Kindle Singles just to see what is out there. For those of you who don’t know singles are $.99 E-stories. The main thing I notice is a variation of size of these stories. Some are 10 page short stories and others are 1000 page epics. Some sell like hot cakes and others people couldn’t give away with a hug. I can’t seem to track much in the way of rhyme or reason, so I figured I would ask the audience and see what everyone other there in social media land thinks. If there is one thing I learned from 7th grade science it was that there can only be one variable in an experiment. So, my question is how much would you pay for a 30 page E-story? Before I say anything else, I think you should watch this for at least the opening scene. That was by far my favorite part of the whole show. You can turn it off after that, but watch the opening. I was a huge fan of the movie, and had learned that it was originally pitched as a TV show but had been squelched, so they adapted it for film. So, when I heard Zombieland was going to get its chance on the small screen, I was excited then I was worried. When the pilot came up on my Amazon Prime account this week I decided to see what it was all about. One of my goals in life is to find someone who has lived under a rock and doesn’t know the plot points of Star Wars and see what they think after watching episodes 1-6 in order, because that would result in a different experience than anyone who watched it in the traditional order. In this case I have seen the Zombieland movie, which I think is a thousand times better than the pilot. So, if you haven’t seen the movie, watch the pilot first and let me know what you think of it. My biggest issue with the pilot is that it is supposed to be the same four characters as the movie taking place following the events of the film. The film characters were amazing, and their appearance fit the character’s personality perfectly. Woody Harrelson as Tallahassee was one of the greatest characters I’ve ever seen in a movie. The new Tallahassee lacks the crazy factor, and seems more like a functioning simpleton than the zombie slaying, powder keg, that Harrelson portrayed. The new Columbus is almost forgivable, but they went full nerd on him. Jessie Eisenberg made for a convincing nerd who was an extreme introvert, but at the same time he looked like he could lift a calculator. This new one looks far more like a mathlete who isn’t a big supporter of rule #1. Wichita doesn’t have that same look of innocence and trust that Emma Stone brought to the role. The new Wichita lacks the allure of Stone, and seems more like an only option left desire for Columbus. Little Rock I have no qualms with either way. Now, if this was the only crime committed I would probably be able to come to terms with the reinvention of characters I loved, but sadly this isn’t where the issues end. Just to avoid frustrating people this is the part where I’m supposed to say Spolier Alert. There is a point in the show when they are searching a house for two suppose survivors that should be inside. Part way through the search Columbus decides to stop searching and use the bathroom, but leaves his shotgun outside. Rule #3 is: beware of bathrooms. You can’t make characters do something uncharacteristic for the sake of the story. Yes many shows do this, but it offends my B.S., M.A., and M.F.A in creative writing, and immediately signals the end of a show for me. I don’t want to ruin more of the pilot for people who will watch it, but this isn’t the only instance of plot defeating character. The show did have funny parts. Nowhere near as clever as the film in its humor, but there were humorous segments. Personally if I had been the writer tasked with creating this show, II’d of set if a few years later than the movie when Little Rock is around 18 and have the show revolve around her after being separated from the other three. The audience could forgive the recast much easier for a character that has gone from child to adult. The show could focus on her trying to find her sister, with a new group of survivors. From her time with Columbus, she could now be the carrier of the Rules, and we could have a new cast of characters that we wouldn’t be comparing to the old ones. You don’t have to say how she got separated from the others, or which of the others are still alive to keep the audience in wonder. This could also open up the possibility of the original actors making cameos on the show.